Nate Bosch (pictured in middle), director of the Center for Lakes and Streams at Grace College, Winona Lake, Ind., accepts grant from Toyota Motor Sales, U.S.A., Inc. with Gabe Douglas (picture on left), sales manager at Toyota of Warsaw, Ind., and John Rice (pictured on right), general manager at Toyota of Warsaw, Ind. The Center for Lakes and Streams at Grace College, Winona Lake, Ind., received $15,000 from Toyota Motor Sales, U.S.A., Inc. to promote environmental education through water-related STEM (science, technology, engineering and math) initiatives in local schools and through the Northern Indiana Lakes Festival community education initiative. The center is using the money to increase environmental literacy in the northern Indiana region, as it relates to understanding and taking care of the many local lakes and streams. “With the help of Toyota of Warsaw, this is the second substantial grant we’ve received from Toyota, and we’re honored that they’ve chosen to invest in our particular region, having recognized the uniqueness of our water resources and the need to take better care of them,” said Nate Bosch, center director. 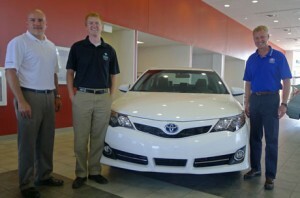 The first grant from Toyota came last year in the amount of $25,000. The center has now received a total of $40,000 from Toyota. The center serves nearly 3,000 K-12 students every academic year. Public, private, and homeschool students engage in hands-on lake and stream learning experiences through programs like Lake in the Classroom, Field Days and the Wonderful Water Student Art Contest. The grant also helped fund the Northern Indiana Lakes Festival, which took place June 6-15. Nearly 5,000 people got to experience and learn about the lakes through opportunities like free canoe rentals, fishing workshops, and hands-on demonstrations by leading water-related nonprofits and government agencies. Toyota partners with philanthropic organizations across the country, with a focus on education, safety, and the environment. As part of this commitment, they share the company’s extensive know-how garnered from building great cars and trucks to help community organizations and other nonprofits expand their ability to do good. For more information about Toyota, visit www.toyotanewsroom.com and www.toyotawarsaw.com. The Center for Lakes and Streams at Grace College conducts research, provides resources, engages and educates residents, and collaborates with local organizations in efforts to make the lakes and streams of Kosciusko County cleaner. More information is available at lakes.grace.edu.